With its unique combination of "reading, seeing, and doing" through lavish use of video, tables and charts, learning exercises, troubleshooting examples, and practical tips for getting the most from treatment interventions, Learning Cognitive-Behavior Therapy: An Illustrated Guide is designed to help both students and practitioners master the core methods of this proven form of psychotherapy. This easy-to-use guidebook offers brief video vignettes (included on DVD) of master cognitive-behavior therapists who show how to implement the most important techniques of CBT, such as The collaborative therapeutic relationship Full descriptions and instructions on the most effective behavioral strategies; a program designed for achieving competency An integrated cognitive-behavioral/biological/interpersonal model for treatment Instructions on fully integrating CBT with psychopharmacological intervention and on formulation and treatment planning methods endorsed by the Academy of Cognitive Therapy Learning Cognitive-Behavior Therapy: An Illustrated Guide covers all of the key features of CBT, beginning with the origins of the CBT model and an overview of core theories and techniques that guide the work of effective cognitive-behavior therapists. Subsequent chapters cover In-depth explanations and illustrations of the core methods and desired elements of the therapeutic relationship in CBT, including how to conceptualize a case with the CBT model and how to structure effective sessions The critical functions of structure and psychoeducation Pragmatic instructions on how to implement the most important CBT methods, including specific methods used to identify and change maladaptive cognitions and behavior in major psychiatric disorders, from depression and anxiety to bipolar disorder, psychoses, and eating and personality disorders A unique troubleshooting guide to assist readers in overcoming common clinical problems in implementing CBT Helpful learning exercises to enhance understanding and put CBT interventions to work Guidelines and measures to assess progress toward achieving competency in CBT and continuing to build skills in this effective treatment approach This remarkable volume concludes with two appendices of practical worksheets, checklists, thought records, and other written exercises for clinical practice, and recommended web sites and other CBT learning resources. A DVD is also included. 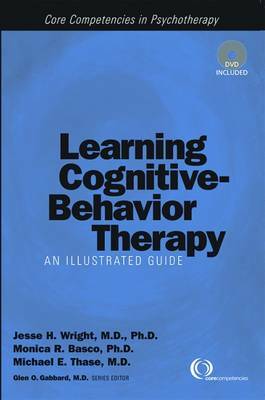 Written by expert cognitive-behavior therapists, Learning Cognitive-Behavior Therapy: An Illustrated Guide is the essential resource for students of medicine, psychiatry, psychology, social work, pastoral counseling, and nursing and for practitioners who wish to learn the invaluable techniques of CBT.